The Fight Cave Activity is located inside of the city of TzHaar, a city under a volcano. Inside the volcano is an Activity that will test your strength against waves of very vicious creatures. It's very difficult, and only the best will survive to the end. You will not lose your items if you die in The Fight Cave as it is a safe Activity. To survive in The Fight Cave, you will need the proper stats, gear, and items. Note: "Long Rock" stops all long range attacks, and you can trap the larger monsters on "Italy Rock". 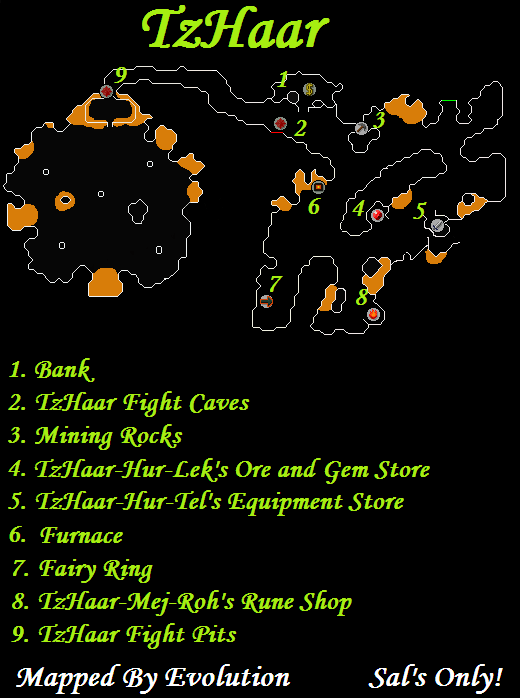 You will go to one of these when the Yt-MejKot's (level 180) start to come if you have decided to range them, and you will go to "Italy Rock" when TzTok-Jad comes. These drain your Prayer Points for 10% of the damage they hit, plus one. Strategy: Range these when you see them. This form acts as a Ring of Recoil. You get dealt 1 damage every time you hurt it using melee. It splits into two Tz-Kek (level 22) when you kill it. Strategy: Either melee them with Guthans, or range them. These form from the Tz-Kek (level 45) when they die. Strategy: Melee them with Guthans, or range them. These melee and range you, so kill them fast! Strategy: Melee them with Guthans, or range them. 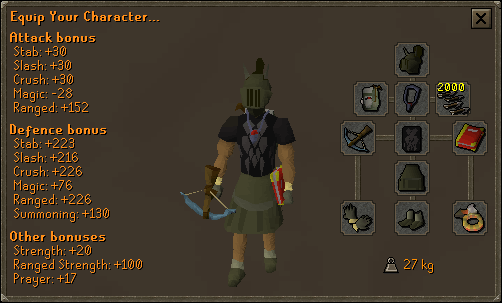 If you are going pure range, pray against these unless you have a high Defence. These only melee you, but they hit hard and fast! They can heal themselves and other monsters when you are in their melee range, so trap them at the Italy Rock! Strategy: Melee them with Guthans and protect from melee prayer if you need some quick healing, or range them. These mage and melee you, but they will not melee you if you stand 2 or more squares away from them. Strategy: Always use the protect from mage prayer in the waves that you encounter them, and always range them. Warning: He has a max hit of 980! Strategy: Since he can kill you in one hit, use your protect prayers against him at all times. Stay at the Italy Rock and always range him. Use Protect from Mage prayer all the time on him. If you see him "bow" towards you and hear a woosh sound, use protect from mage attack. If he stomps on the ground with both front feet, use protect from range. 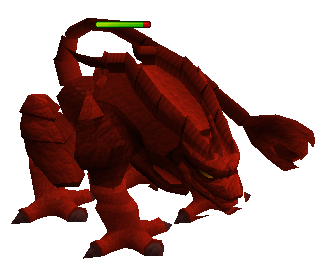 These appear when TzTok-Jad is at half health. They heal him, so distract them by ranging them and/or killing them. Killing them is optional. Any time that you're in a wave, and the specific circumstances let you do something a much easier way, go for it. This guide tries to be as all-encompassing as possible, but there are countless ways that the monsters can spawn in any given wave, and accounting for all of these is near impossible. The point here is, simply put: Think on your feet. If opportunity knocks, open the door. These are guidelines, not laws. Feel free to improvise if you see an opportunity present itself. At this point, there's not a lot of safespotting needed. The 22s take up only one space, so they're not really safespottable. The 45s can be trapped against rocks, but they don't do enough damage to make this worth the effort. The only thing to keep in mind is to be at the correct spot at the end of wave 14. Here, we introduce your best friend, the Small Claw Rock. This rock is located along the north wall of the arena. Note: The southwestern corner of the Small Claw Rock has a skeleton, which is useful for judging safespotting distances. Since this skeleton is the very corner of the rock, make sure to be one space back from it if you're trying to safespot a monster against that corner. You'll be using this corner for 90% of the monsters that you have to safespot. At the end of wave 14, you want to stand in the square northeast of this skeleton, with the camera pointing west. If a 180 spawns in the northwest corner of the arena (which is where your camera should be pointing), run to the square southeast of the skeleton. Otherwise, just sit tight and the 180s will get stuck 100% of the time. Once you get to the point where you have to deal with 90s and 180s, you may need to run too far from the Small Claw Rock, and the 180s will no longer be trapped. When this happens, run straight through the 90, so that the 180 gets trapped behind it. When the 90 dies, you can either put protect from melee on and run through the 180, or conserve prayer by running in a fairly wide arc around the 180 so that it can't hit you. Once you get back to the Small Claw Rock, the 180 should be trapped south of this rock. Once this happens, you're back to business as usual. The tricky part is when you're on the last wave of this section, the two 180s at the same time. There's a 64% chance that neither of them spawn in the northwest corner of the arena, and there's a 4% chance that both of them spawn in the northwest corner of the arena. In those cases, you don't really have to do anything special. In the 32% of the time that you get one in the northwest and one elsewhere, don't panic! Start by going to the spot to trap the northwest 180, and once the one south of you shows up on the minimap, either run in a wide arc around it, or put protect from melee on and run through it. In either case, your final destination is the south side of the Big Claw Rock, located on the west side of the cave. Go there, and both 180s will become stuck. Kill the first one, and then head back to the Small Claw Rock on the north side and trap the 2nd 180 as usual. Once its health is low enough that you are capable of killing it in one hit, put on protect from magic. As soon as you see it start the death animation, run to the north side of the Italy Rock (on the east side of the arena), and get right up next to both the north side of the Italy Rock and the east wall of the arena. Since after the two 180s is the first of the 360s, you want to be sure to not take off protect from magic, as the 360s can easily kill you in two hits. For each of these waves, you want to be on the north side of the Italy Rock, right up against it, as far east as you can go. When the 360s spawn, they may get trapped on the other side of the Italy Rock. When you see that they are stuck here (make sure that you see them, as it sometimes takes 10 seconds or more for them to walk over close enough to attack you. At this point, this is the only safespotting you can do. Just be careful when the 90s come, as you have to keep protect from magic on. For these waves, you need to go back to the Small Claw Rock in the north of the arena. You'll need to be back at the same spot near the skeleton for the start of each wave. If the 180 spawns in the northwest, run around to the east side of the Small Claw Rock, and go all the way north until you're standing against the Small Claw Rock and the north edge of the arena. This should draw the 360 close enough that you can kill it without the 180 becoming unblocked. If the 180 does not spawn in the northwest, run north until you're at the north edge of the arena, right next to the west side of the Small Claw Rock. This will accomplish two things. Firstly, it keeps you next to the Small Claw Rock, so that the 180 will be blocked. Secondly, it draws the 360 close enough that you can range it even if it's behind the 180. Case 1: The 360 is in the front, followed by the 180, with the 90 in the back. In this case, you have to run in a big arc around the 360, and keep your distance from the 180 so that you don't get hit hard by its melee. Your destination is the south side of the Big Claw Rock. Stay close to the Big Claw Rock, and go all the way to the west wall. This should draw the 90 close enough that you can kill it. Once the 90 is dead, run back around the 180 and 360 to trap the 180 behind the 360. Once the 360 is dead, trap the 180 against the Small Claw Rock like normal. Case 2: The 360 is in front, followed by the 90, with the 180 in the back. In this case, you need to get close enough to the 360 so that you can shoot the 90, but not so close that the 360 can melee you. Once the 90 is dead, kill the 360 and trap the 180 like normal. Case 3: The 180 is in front, followed by the 360, with the 90 in the back. In this case, you're in a lot of trouble. 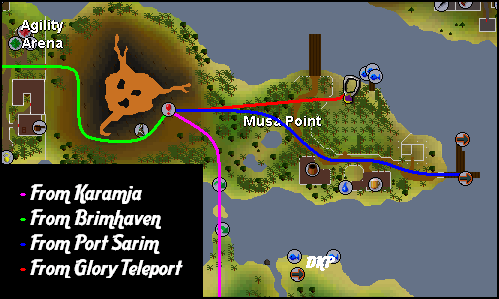 If you have enough food/saradomin brews left to sustain a good 30-40 damage, run through the 180, around the 360, and kill the 90 with the 180 stuck behind the 360. Then, kill the 360, and trap the 180 against the Big Claw Rock. Don't kill it yet, but instead, run back around it, to the normal spot at the Small Claw Rock. If you can't afford to take 30-40 damage, kill the 180, and then get close enough to the 360 to range the 90 without getting melee'd. Unfortunately, neither of these options is very good, but this spawn pattern isn't very good either. Tip: If one or more of the main monsters (360s, 180s, and 90s) spawns in the northwest, you may need to run around to the east side of the Small Claw Rock, to draw any others closer. Beyond that, just combine ideas from other similar scenarios, and think clearly. It's really easy to panic and get hit by the 180, but if you keep your cool, it will never touch you. Case 1: The 360 spawns in the northwest, and the 180s spawn either somewhere to the south, or behind the 360. In this case, you'll be able to kill the 360 from the safe zone on the west side of the Small Claw Rock. Keep in mind that you don't have to be right up against the rock, as the 180s are 4 spaces wide. Once you kill the 360s, block the 180s on the Small Claw Rock as usual. Case 2: The 360 and a 180 spawn in the northwest, with the 180 in front of the 360. In this case, you'll want to run south (avoiding the 180 that's to the south! ), and head to the south side of the Big Claw Rock. Make sure the close 180 gets trapped against the rock, and run all the way to the west wall of the arena. The 360 will end up north of the Big Claw Rock, and will be stuck. Range the 180 that is stuck against the Big Claw Rock (If you're a safe distance back from the end, you can even turn off protect from magic to save prayer points. Just make sure to turn it back on when you come out again! ), and then run out past the end a short way to lure the other 180 over to the end of the Big Claw Rock if it isn't already there. Once the 180s are dead, make sure you have protect from magic on, and kill the 360 as normal. Case 3: One 180 spawns in the northwest, and the other two spawn somewhere to the south, with the south-spawning 180 behind the 360. This case is tricky. Depending on the specifics of where the south-spawning 180 and 360 are relative to each other, you have to go either to the southern edge of the Big Claw Rock, or to the southern edge of the Italy Rock. As to which of those rocks to use, just use whichever one will put the 360 in front of the 180s. 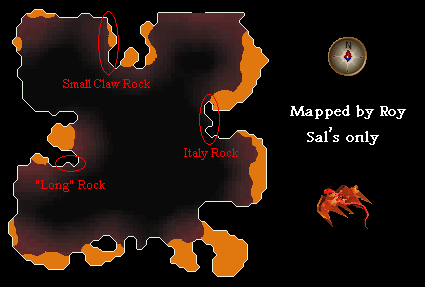 In either case, you want to run all the way to the wall (either the east or the west one, depending on whether you have to use the Big Claw Rock or the Italy Rock) to lure the 360 closer. Once the 360 is dead, use the method described for the wave with the two 180s to finish the wave. Case 4: Both 180s spawn in the northwest, and the 360 is to the south. In this case, you want to run around to the east side of the Small Claw Rock, and then all the way north to the north edge to draw the 360 closer. Kill the 360, and then kill the blocked 180s. For the wave with the two 360s, there's not really any safespotting needed, since none of them can hit through your protect from magic prayer. Just make sure to kill whichever one is furthest from the Italy rock first! For the boss, you want to start right next to the Italy Rock and the east wall of the arena. There's not really a way to get him trapped 100% of the time, but this method has the highest percent chance of trapping him. If he spawns directly south of the Italy Rock, he will get trapped on the other side of it, and if he spawns in the middle of the south side of the cave, he may also become trapped. If he becomes trapped, you won't have to rely on sound for the first prayer. Also, if he is trapped, you can lure the healers to the other side of the Italy Rock once they come. This lets you focus 100% of your attention on killing them, as opposed to dividing your attention between the healers and the prayer switching. If Jad doesn't get trapped, you can still deal with the healers by attacking each one of them at least once. 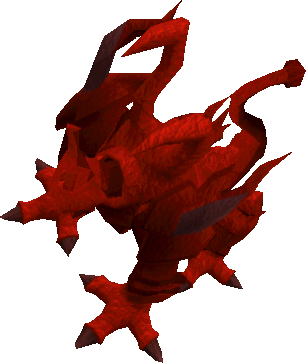 This diverts their attention, so that they go after you instead of healing Jad. Once they are all paying attention to you instead of Jad, you need to run through Jad, so that they get trapped behind him. This is dangerous, as you have to put protect from melee on and then switch prayers if you see him start a range or magic attack, but it's a foolproof way to trap the healers. Once the healers are trapped behind Jad, you just have to finish off Jad! Kill the Tz-Kihs (level 22) if they get too close to you. They drain your prayer and you can take them out in one hit, so its best to take them out early. Kill the Tok-Xils (level 90) next before they do a lot of damage to you. Kill the Ket-Zek (level 360) next if any are present. Trap the Yt-MejKot (level 180) behind the Ket-Xek (level 360) and you can attack it without worrying about dying. Kill the Yt-MejKots (level 180) next. You can trap them at the Italy Rock and take them out easily with range. You can also heal on these if there are two of them. Kill the Tz-Keks (level 45/22) last. 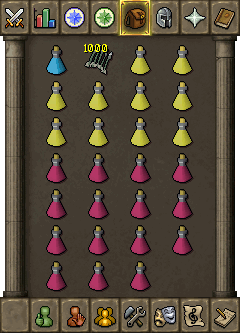 If you have Guthans, you can use these guys to heal on. When you get to TzTok-Jad, go to the entrance of the Fight Cave. Use protect from range prayer, and if you hear a woosh sound, use protect from mage. If you hear no sound at all for around 30 seconds or so, go to Italy rock (near the vent), and range him. 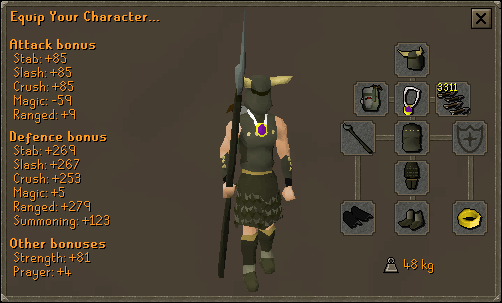 If you hear a sound, put on protect from range prayer, and go to Italy Rock. Have auto retaliate off at all times while fighting TzTok-Jad. Your log out request has been received, and after this wave you will be logged out with your progress saved. If you click log out BEFORE the end of the wave you will log out, without saving the progress. If you click log out AFTER the end of the wave you will log out, with saving the progress. If you get disconnected from the game in the middle of a wave, you will resume the match from the beginning of your current wave. Aaahhh, yes. The part that you have all been waiting for. 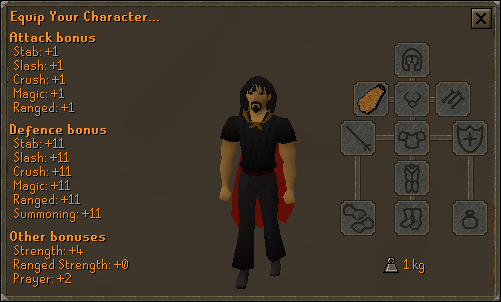 When you defeat TzTok-Jad, you will be given a Fire Cape, and 8,032 TokKul, the currency of TzHaar. 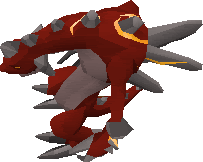 If you lose to TzTok-Jad, then you will only be given 4,000 TokKul, and no Fire Cape. If you lag out or disconnect, you appear at the beginning of your most recently completed wave. 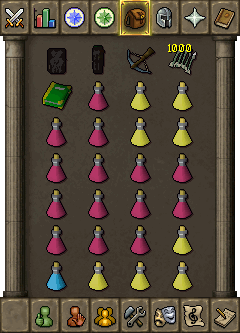 If you complete the cave more than 1 time, you will receive another Fire Cape, which you can sell for 8032 TokKul, the equivalent of beating Tz-Tok Jad. You also get the normal 8032 TokKul.